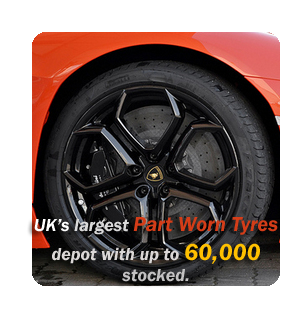 Run Flat Tyres Liverpool are a fantastic new technology, which is found on high end sports cars, hatchbacks and saloons, and are made to keep you driving, even if you have a flat tyre. Run flat tyres are designed to maintain the shape of the tyre, even when it loses pressure. Motorist from Liverpool driving a vehicle fitted with run flat tyres can continue driving for another 50 miles, at speeds of up to 50mph, allowing them to get off the motorway, or to a garage to get their tyre changed. We have the largest stock of nearly new Run Flat Tyres in Liverpool. We carry all sizes including 16″, 17″, 18″, 19″, 20″, 21″ in all the top manufacturers such as Pirelli, Bridgestone, Continental, Dunlop etc. We pressure test and fully guarantee all our Run Flat Tyres. There is vast savings to be made if you need Run Flat Tyres in Liverpool, for example 205/45/17 Bridgestone Run Flat Tyre you could pay up to £170 each. We sell this size starting at £40 fitted and balanced.